The Alco S-1 switcher was introduced in 1940, the first Alco switcher of low profile hood design to compete with the EMD and Baldwin switchers of a similar design. This low hood design offering a better front vision for the engine crew than the earlier Alco high hood design switchers. Powered by the Alco designation 539 diesel prime mover that produced 660 HP. These switchers rode on Blunt B-B trucks. The first S-1 switchers were delivered to the New Haven Railroad in 1941, deliveries continued until 1949 for a total of 65 units. These diesel switchers replacing 0-6-0 steam switchers on the roster. 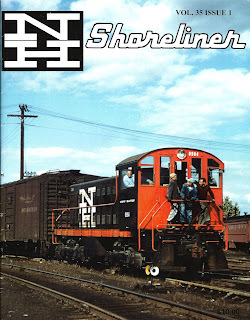 There is a comprehensive article about New Haven Alco S-1 switchers including many photos authored by Marc J. Frattasio and William S. Chapin in the New Haven Railroad Historical and Technical Association magazine Shoreliner volume 35 issue 1. This excellent issue, the cover pictured below, is still available as a back issue from nhrhta.org. This magazine is a good read and must for modeling the New Haven S-1. Another great reference is the book New Haven Power by J. W. Swanberg, in addition he also authored an article in the above Shoreliner about working on the S-1 and S-2 locomotives. One of the interesting challenges of modeling most New Haven Railroad diesel locomotives is that the railroad's diesels had features that differ from the standard design of the locomotive builder, the S-1 is no exception. 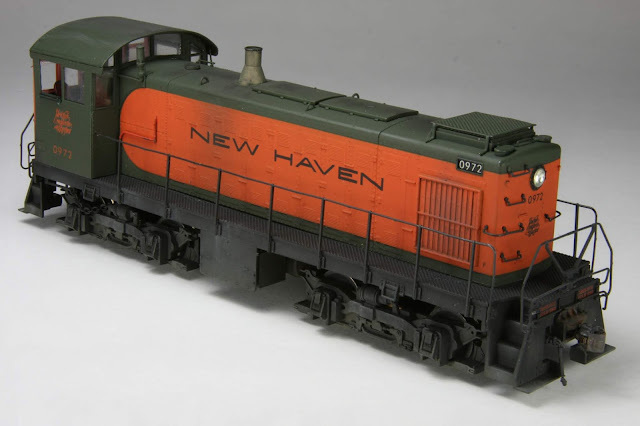 These switchers also had many different paint schemes during their tenure on the New Haven and some equipment variations depending on the road number, again the Shoreliner article is the best reference when modeling a specific unit and era. The New Haven ordered their S-1's with low profile cab roofs that were about 6" lower than the standard design for a greater clearance from the high voltage overhead catenary in the electrified zones and other areas that would be inaccessible with the standard cab height. This was achieved by lessening the curvature radius of the cab roof in the center opposed to the standard design roof that had a continuous radius arch from side to side. This compound curvature of the roof resulted in the NH cabs being very distinctive in appearance from the standard design. The starting point for my model is a Life Like Proto 2000 S-1. Like many models of its era of manufacture this model is of the prototype locomotive builders standard design that is correct for most railroads, but this model has an incorrect cab for the NH. 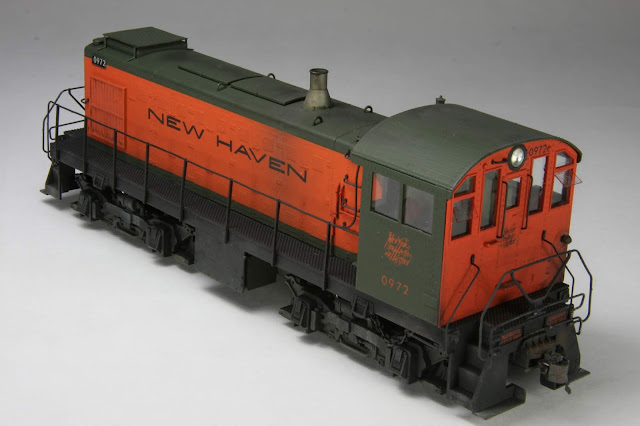 The model was purchased about 15 years or more ago when they were first released because it came factory painted for NH road #0972, the prototype seen below was photographed in Danbury in 1957 switching express cars therefore is appropriate for use on the layout. Correcting the factory installed cab on the Proto 2000 model has long been on my things to do list but pushed to the back burner by many other other projects. William (Bill) Chapin co-author of the Shoreliner article did a great job of modifying the cab on his switcher, this being the only one that I knew of with a corrected roof profile cab in HO scale. Having a prototypically correct replacement cab has been talked about for years by NH modelers but none has ever been produced ether in resin or by injection molding most likely because of the insufficient numbers that would purchased to turn a profit by the maker. Good quality and reasonably priced 3D printing has now made a correct NH cab possible. Mike Redden, a skilled NH modeler has designed an accurate low profile replacement cab kit for 3D printing to fit the Proto 2000 S-1, this cab is available for purchase from Shapeways . I ordered one as soon as they were released for sale. The kit arrived from Shapeways quickly and well packaged with the pieces individually enclosed in separate plastic bags. This is my first experience with 3D printed parts. The kit pieces received are high quality free from flash or warping. The detail is clear and excellent down to the smallest rivet. The 5 pieces of the kit are pictured below. The Proto 2000 body shell with factory cab removed. The difference in the roof profile is evedent when placing the rear of the replacement cab against the factory cab. With the cab kit needing to be painted and have the glazing installed from the inside of the cab, the following is the cab assembly sequence that I chose. Holes were drilled for the hand rails on the cabs rear panel. The step to door handrails and one upper grab from the original cab will be reused. New shorter handrails on the cab door sides will need to be fabricated, these were made from .015 phosphor bronze wire with holes in the cab drilled to match. 2. Paint the 5 kit pieces and repaint hood. Modeling #0972 as in the 1957 prototype photo above called for NH #401 green being applied to the cab front, sides and roof and NH warm orange to the cab rear panel. Also the green applied to the hood of the out of the box model needed to be changed to #401 green and was repainted at the same time as the kit pieces. Tru-color #38 401 green and Tru-color # 36 warm orange were used. The headlight bezel was painted black. The orange New haven script lettering and numbers for the cab sides came from an old Accu-cals set that I have had for many years. I used these because the orange matches the warm orange paint well, I do not know of this sets availability today. Below are the painted and decaled kit pieces. The lines across the kit pieces that can be seen in the photo above I assume are from the printing process and show with a gloss paint applied. These are far less noticeable once the painted surface is dulled with an initial weathering coat before assembly. First a coat of acrylic grimly black thinned 10:1 with 70% alcohol was sprayed over the parts followed by 2 coats of dulcote, results below. Mike Redden also offers a glazing set for this cab, it is reasonably priced and the individual windows fit very well. You can order the glazing set directly from Mike by clicking on the NE Model Works link on the Shapeways page that features the cab kit. I thought that it would be much easier to install the cab windows before assembling the cab while the pieces could be worked on the flat from behind as seen below. Formula '560' canopy glue was used. The handrails on the rear panel of the cab were installed during this step after the windows were in place. To assure that the cab would sit flat once on the Proto 2000 model platform after assembly the kit was glued together on a glass work surface. A square corner jig was temporarily formed by taping 2 straight edges together on the glass surface as below. I decided to start by gluing the cab sides to the cab front first. Glue was applied to the pieces and quickly pushed up against the temporary square jig and checked with a small combination square head as below. Maxi-Cure ACC was used to bond all pieces. The opposite side was affixed the same way then the roof was glued on next making sure all the pieces were square to each other. The rear of the cab was glued in place last finishing the assembly of the low profile replacement cab. The design work of this kit is superb, with care during assembly all the kit pieces will fit together quite precisely as one would experience with an injection molded kit. The finished cab fits on the Proto 2000 S-1 platform as well as the original cab. One thing I would do differently is to paint the insides of the cab pieces black or gray before installing the windows and assembling the cab. One more way the New Haven S-1's differed from other railroads is that they were equipped with a whistle instead of an air horn. A Custom Finishing Models #103 whistle was used for this detail. A mounting bracket was made from styrene strip using a photo in the Shoreliner S-1 article as a guide, the piping and elbow came from brake piping that was in my scrap box. These whistles were mounted in differing locations on these locomotives, referring to the article once more the whistle on # 0972 was located approximately 1 foot beyond the cab roof overhang. Below is the whistle, bracket and piping assembly before painting. When this model was new a basic DCC decoder was installed, it ran well but installing a new sound decoder while apart for the cab change will bring it up to today's layout standard. An ESU Loksound #73800 select micro decoder and #50321 speaker were installed. They are both are good fit for this models chassis, see photo below for mounting locations. The speaker enclosure included in the #50321 speaker kit was assembled to its lowest profile to fit under the body shell. Alco 6 cyl 539 prime mover sounds article #73489 were downloaded from the ESU website and programed into the decoder with the ESU programer. The whistle sound was chosen from the selections of playable horn sounds. The sounds are very prototypical for a Alco 539 non turbo prime mover and whistle. After programming CV 54 to 0 using the recommended procedure, this model now runs exceptionally and prototypically well at switching speeds that it is intended for. I chose not to install lighting on this switcher using MV #136 lenses instead. The mounted whistle can be seen in front of the cab in this photo. Holes in the front of the cab for the side handrails were drilled after the cab/hood were mounted on the base platform. These upgrades have transformed this model from a seldom used shelf queen to a permanent switcher in the Danbury yard on the layout. It looks right, runs and sounds great! As usual it came out looking great Joe! Thanks Jim, but it's because this cab replacement kit is great! Wow Joe - your usual very impressive work evident again! That engine looks outstanding! And I really appreciate the details on how you put it all together. I'll be using this post as a guide for doing my own S-1, hopefully soon! Thanks Chris. Assembling the kit is pretty straight forward, glad the post may be of some help. The flipped open windows on the cab end are a nice touch. Took me several views to notice! Joe, your S-1 is fantastic. I still need to find the time to complete my own S-1s and S-2. Seeing your completed model really makes the design work worthwhile. May I add a link to your page to the Shapeways product page? 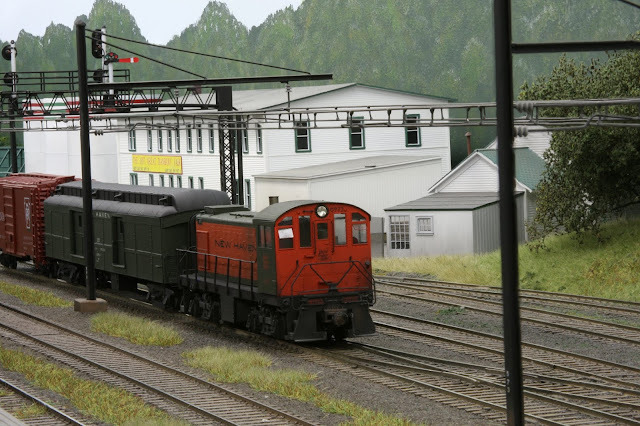 Mike, Thanks for offering this well designed kit that has been long desired by us New Haven modelers! You may link my blog on Shapeways. Find the time to build your own! !